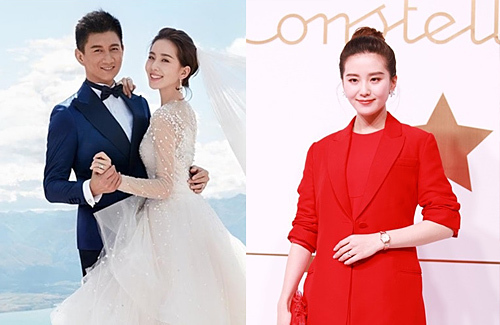 Nicky Wu (吳奇隆) and Cecilia Liu (劉詩詩) fell in love during the filming of Scarlet Heart <步步驚心>. They dated for four years before tying the knot in Bali in 2015. Today, Nicky’s mother personally announced that Cecilia is already five months pregnant and they are expecting a baby boy! Ever since Cecilia announced her break in June from the industry for rest time, there have been speculations that the couple was expecting. In a promotional video in which the couple appeared together in September, only half her body was filmed which started the rumors. In October, when she attended an event in Shanghai looking fuller in shape, fans knew immediately that she was pregnant. The two were spotted walking in Taiwan with a hat and face mask. Cecilia was wearing an oversized shirt while Nicky was very cautious to make sure his wife was okay including entering and exiting the car. Cecilia’s should be delivering her baby next year May in Taiwan as she is residing there currently. Nicky is usually a low profile celebrity and did not plan on sharing the news, as he wanted his wife to rest well. But today, he shared the good news on his social media platform with his fans expressing “We are happy to announce that a new member will be joining our family. Thank you to everyone for your care and support.” Cecilia also commented, “Excited!” on her own platform. She must have been super skinny because she looks basically still slim. Anyway a baby? Not twins? Usually IVF yields twins . @funnlim not necessary. Twins are high risk. So normally doctor will suggest only putting 1 egg in. Especially, if woman is still young. @happybi from what I read the doctor usually implants more than one to ensure higher success rate, unless this practice has now changed. @passingby I guess depend on the Dr. As yes there is a higher chance to concieve with more eggs, but having twins and triple are high risk for the woman. So if the woman is young, they will just put 1 in. @happybi maximum number of eggs for IVF is 2…because there is a chance for twins or triplets. why would Cecilia need IVF when she is young? @janet72 There are many young couples who can’t conceive. Could be the man’s problem. Could be the woman’s problem. Or both. @janet72 she is young but fertility issue can happen. I mean she is pretty skinny. Or it could be an issue on Nick end as he is not young anymore. Sperm might need help getting to the eggs. @funnlim I talked to a few moms who did IVF, you only get twins if you ask for it. You don’t just get twins accidentally. Next year must be a good year. Everyone seems to be popping out babies. There are so many good news lately seems like 2019 is the year of happiness.